Packed with wholesome brown rice, cranberries and spinach, plus essential vitamins, minerals and taurine to support healthy eyes and a healthy heart. Organic Turkey, Water Sufficient for Processing, Organic Chicken, Organic Chicken Liver, Organic Brown Rice, Organic Coconut Flour, Organic Dried Egg Product, Organic Flaxseed, Organic Cranberries, Organic Spinach, Calcium Carbonate, Salt, Potassium Chloride, Choline Chloride, Organic Guar Gum, Minerals (Zinc Amino Acid Complex, Iron Amino Acid Complex, Copper Amino Acid Complex, Manganese Amino Acid Complex, Sodium Selenite, Calcium Iodate), Vitamins (Niacin, Vitamin E Supplement, Vitamin A Supplement, Thiamine Mononitrate, Pyridoxine Hydrochloride, Riboflavin Supplement, d-Calcium Pantothenate, Vitamin D3 Supplement, Biotin, Vitamin B12 Supplement, Folic Acid), Taurine, Tricalcium Phosphate. Recipe changed. Smells funky, not like chicken. Cats won't touch it anymore. Very disappointed. Long time customer. Not anymore. Don't want to donate to shelter and get any animals sick. 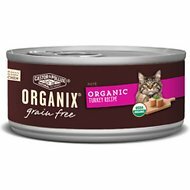 I feel better feeding my cats organic wet food. They prefer this food too. Seems to be a hit! 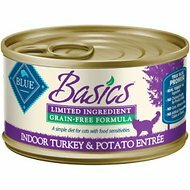 There were a few bent cans in the case, but those that were not bent are being used and my cats seem to really like this food including my picky older cat! We will order it again! My cat don't like it. My cat ate like few cans and now he rejected to eat it. So, basically, all case waisted of money unfortunately. Great my cats love it! Great my cats love it! Yummy wet food! This is a great organic food without carrageenan. This is a good one. All 3 of my cats like it! Will buy again. Bought this for the lower phosphorus level, but cats aren't too crazy about this one. I purchased this because I needed a better quality canned cat food. 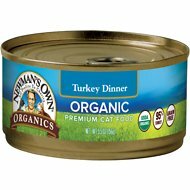 My cats were previously on wellness canned. Organix is great, no issues in transition, my fab 5 liked it instantly! 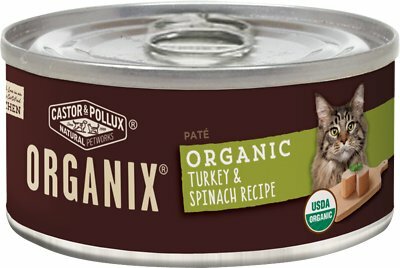 My cats love Organix wet food pate, chicken flavors, but not this pate turkey variety. We'll be sticking with the ever popular chicken choices.